Disclosure: I am an Etsy affiliate, and I get a small commission if you click on any of these links and buy items on the website. Do you know that we kitties have school? It’s true, except we are home schooled by our kitty moms. That’s actually why I’m such a bad hunter — my mom was a pedigreed Somali and she never taught me hunting lessons, probably because she didn’t know how to do it herself. But anyway, enough of that. It’s already time for human kittens to go back to school! 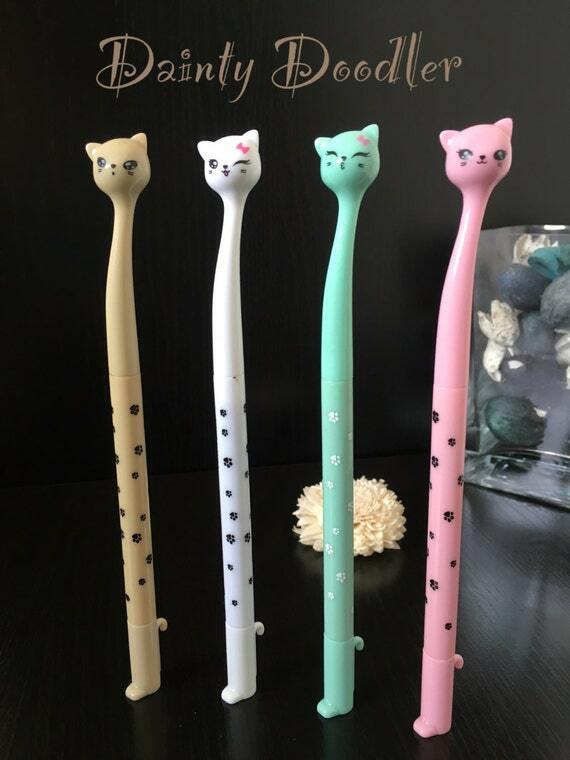 So I’ve gone over to Etsy and picked out some fun cat lovers back to school items. I hope you like them as much as I do! 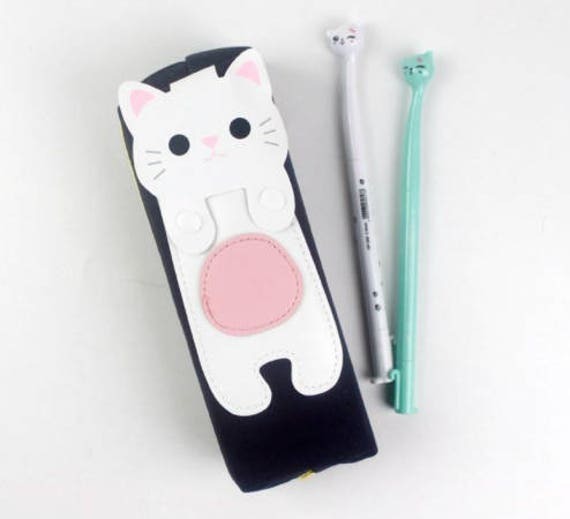 These kitty pencil cases are made from a canvas like material and are totally adorable! Of course, I couldn’t resist adding the pens too. Aren’t they lovely? The gel point is black ink and a fine 0.5mm. They’re available in three colors — the pink is already sold out! The pens and the pencil case above come from the U.K., so if you are in the U.S., shipping may take a bit longer. This fun backpack features a super-cool screenprint cat design. The cotton canvas material is extra comfy — it slips nicely over your shoulders, has a main compartment that cinches closed and a zippered front pocket. It’s 14″w x 17.5″h. 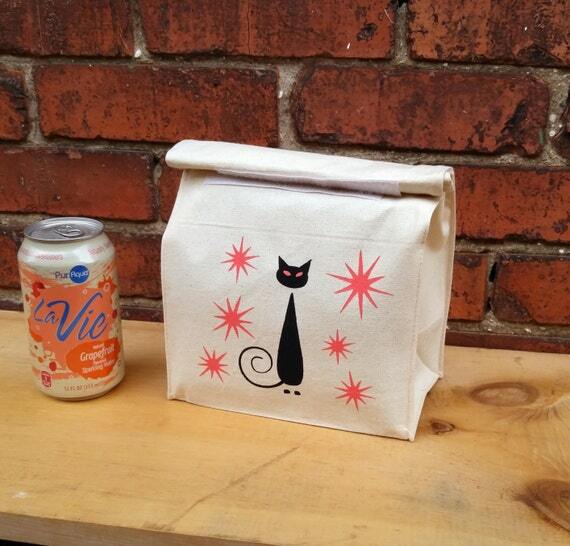 This lunch bag is both retro and totally modern! 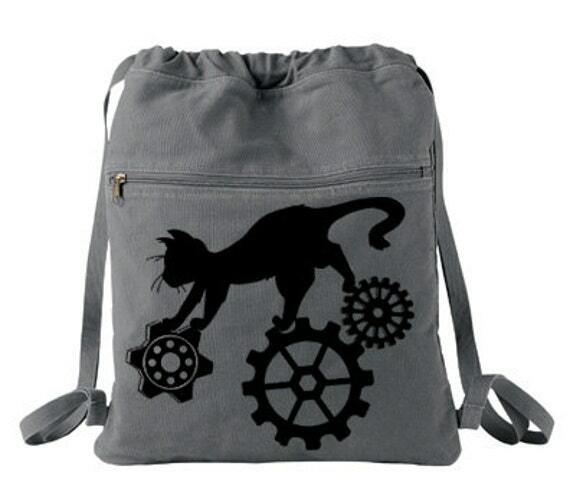 The pink star and black cat design is hand stenciled onto the natural canvas bag. Pack lunch… or use it to pack anything else you can think of! 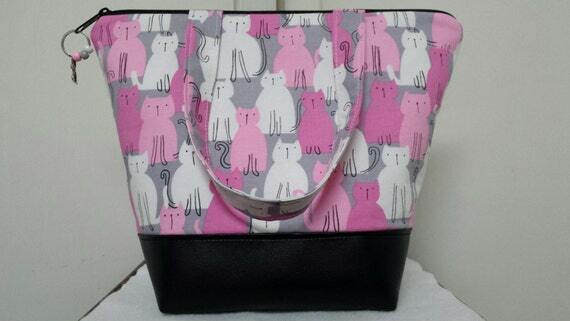 If you want an insulated lunch bag, how about this one, with its cute pink and gray cat print? The outside is cotton and padded, the inside is fully insulated with a water resistant nylon lining. There is also a zipper pocket where you can stash a small ice pack. 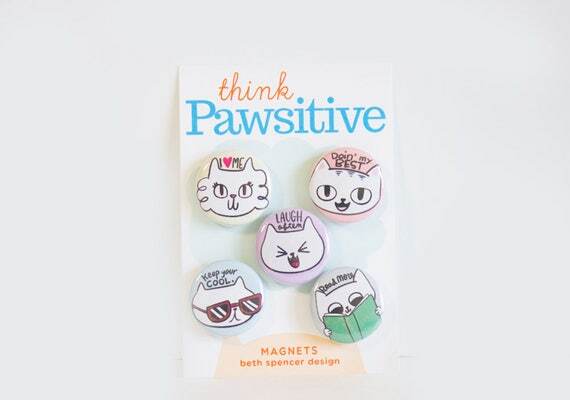 These cute kitty magnets will put your student in a totally pawsitive frame of mind! They make fun locker decorations… or they also come as pins! 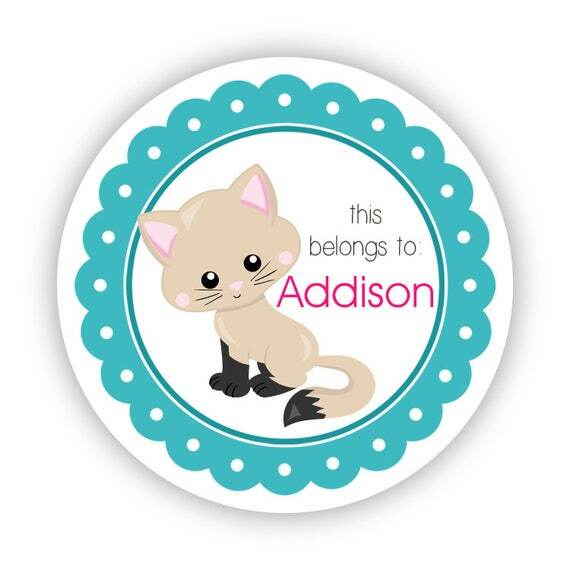 You always need name stickers so that kids can keep track of their belongings… and these are great for kitty lovers! Along with adding a name, these stickers are customizable in a whole bunch of ways — use the drop down menu on the Etsy page to see all the different sizes and number of stickers. 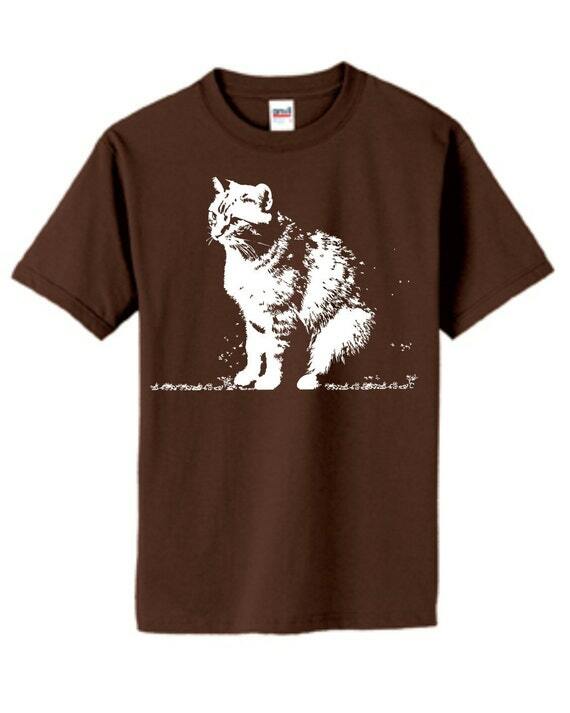 I couldn’t resist adding this awesome kids’ t-shirt from RC Tees because they donate to a variety of animal organizations… and they are pals of ours! Plus it’s a really cool design that comes in a bunch of different t-shirt colors. I’m sure your favorite is there. Mine (Azalea) was! these are all fun finds, Summer! our mom likes the bags. hey, “back to work” after the weekend works, right? Those would make great gifts too for a schoolager…and maybe even a grown up or two! 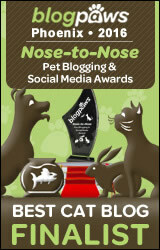 Our human Mom loves it when you do Etsy items on your blog, Summer! She will definitely be checking some of these out. Great post! Those are all really great. TBT loves black ink .5mm. And guess what he just happens to have run out of…? My ‘LL isn’t going to school, but she wants some of those things. MOL. We love all of those! We’ll be counting up our allowance. I love all of these! Violet starts real school this year and I bet she doesn’t have such cute stuff. Those look like some great items. We ordered some pens. Very cute, especially the canvas bag. We avoid plastic & disposable stuff. Great choices, makes me wish I was still in school. I do have the pens, someone gave them to me for Christmas. These are all too cute. I like the pens and the magnets the most. My kind of stuff. Those are some pretty cool products. That very first picture, where you’re sitting there “intelligently,” looks very pretty!! 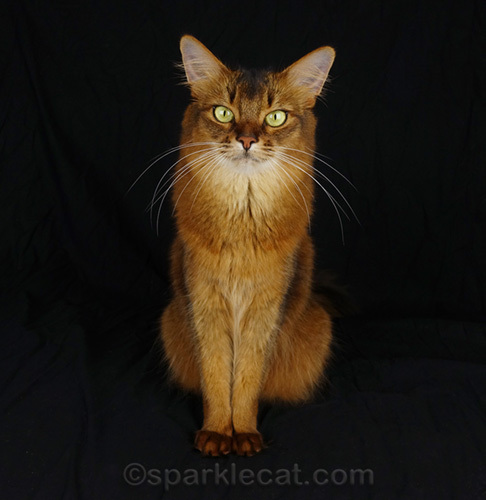 You really are….A Pretty Cat!! Lots of really CUTE stuff for back to school – almost makes me wish I went to school…..well….just a little! Oooo, those are very tempting things. Our Mom especially likes the T-shirt! Thank you for sharing these good etsy finds! That’s right, Summer…kids love cats as much as adults do! Cool stuff, thanks for sharing. These are all great, especially the backpack. Great picks! 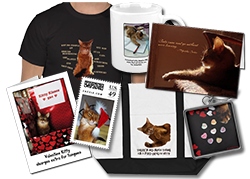 May have to “borrow” our human’s credit card to buy some of these cute items. These are so cool! Mommy favorited a couple of those shops so she can go back and pick out what to buy. She wants a pencil case for work! Hi summer, no photos of you. Are you turning into an advertising site. That’s asad I thought it was all about you. I love that lunch bag! P. S. Mom will be MIA for the next couple of days, she’s going to CA for CatCon. Those are really nice, especially all the bags! Those items are really nice!